The perfect giveaway for every occasion, Personalised Pens are small, lightweight and also incredibly useful. Keep your clients front of mind with a promotional item they can use every day. Perfect for giveaways at trade shows and exhibitions, for a corporate gift included in customer orders, for use at sales counters to enhance corporate identity, or to hand out at business meetings for a professional touch. Our promotional Pens offer high quality with a lengthy lifespan, 15 trim colours and a choice of blue or black ink. 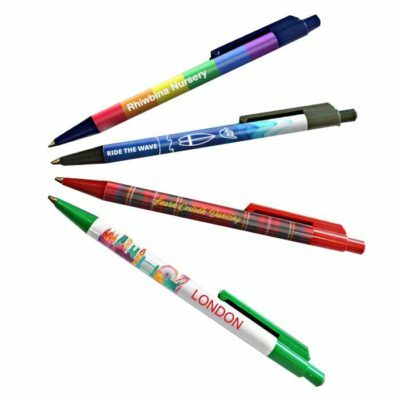 Easily brand these click-top, plastic biro pens by adding your customer’s logo, company name and web address. Our printed pens have a minimum order quantity of 100 units, and a maximum order quantity of 100,000 units. Please request our templates to quickly set up your artwork files.